We hadn't intended to go out to dinner but time got away from me today causing my cooking plans to be shelved until tomorrow. A call to Fenix and good news followed - we'd be going out to dinner! There's a change in the house champagne, we're offered a 1999 Drappier Champagne. 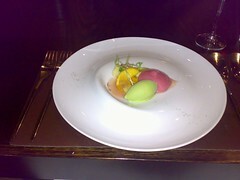 What doesn't change is that we opt for the degustation or as it's called in the menu "Pollination". I should note that most of the dishes following are not those listed on the current degustation menu - I suppose because we've had a lot of the dishes, these ones were created for us. Now that's a nice touch! 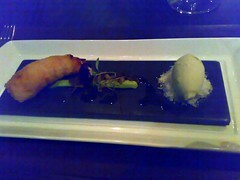 The marron was terrific but the asparagus sorbet was divine - intense flavour in a pure form. A divinely delicious dish - the wonderful 62° egg and meltingly soft pork belly combine with the smoothest potato puree and spiced sherry jelly cubes. The grilled pineapple sits atop crispy black pudding crumbs. 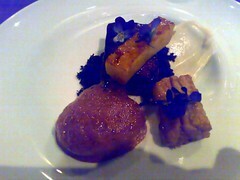 The smoked eel had a fabulous flavour and just fell apart - I can't say I'm usually a fan of eel but this was excellent. 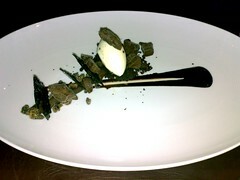 This dish is on the degustation menu. 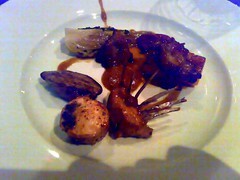 A rack of rabbit and a seared slice of the saddle accompanied by a sautéed kidney and liver. 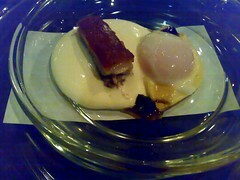 Yes, there are fried shallots in this dessert but they do make sense in the context of the dish. 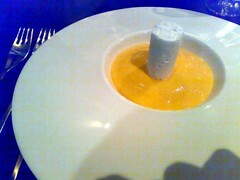 They offer a really interesting crunch and slight sweet tang that complements the smooth mango mousse. A sticky pool of salt caramel sits at the bottom of the bowl.